The Partnership Deed Agreement is usually an agreement that is made between partners when establishing a new or existing business. This partnership deed template helps in setting exact terms and conditions relating to the partners and the functioning and roles of each partner in the Firm. This 3 page partnership agreement template is useful in setting the default terms of the partnership, if in case the partnership is ever in conflict, the rules of the business partnership will default back to those written in the partnership deed. Ensuring that partners are dealt with, in a fair manner. Name and Address of the Partners. The Date of Commencement of the Partnership Deed. The Name and Style of Partnership. Address of the place of Business or Registered Address of the firm. Fill in a description of the Nature of your Business that the firm will carry out. Provision for filling in the Total Capital of the Firm, and the amount each party will contribute towards the capital. The percentage of the net profit each partner is entitled to. Terms for procurement of any additional funds, and carrying out any transaction only with the consent of the partners. Details of the Bank Account which needs to be opened needs to be mentioned in thisPartnership Deed Agreement. Any Cheques, Demand Drafts etc., paid by the customers will be in the firm’s name and be deposited in the partnership’s account. Each partner has to maintain or arrange to maintain the proper books accounts for recording all transactions, and will be kept at a predetermined place allowing each partner to inspect them. No other person will be made a partner without consent of the other partner. The accounts of the firm will be closed on the 31st day of March every year. The partners can mutually agree to increase the capital by bringing in additional contributions. Each partner is eligible to draw loans in the name of the partnership. The partnership will be dissolved only with the mutual consent of all the partners and only after sufficient period of notice. 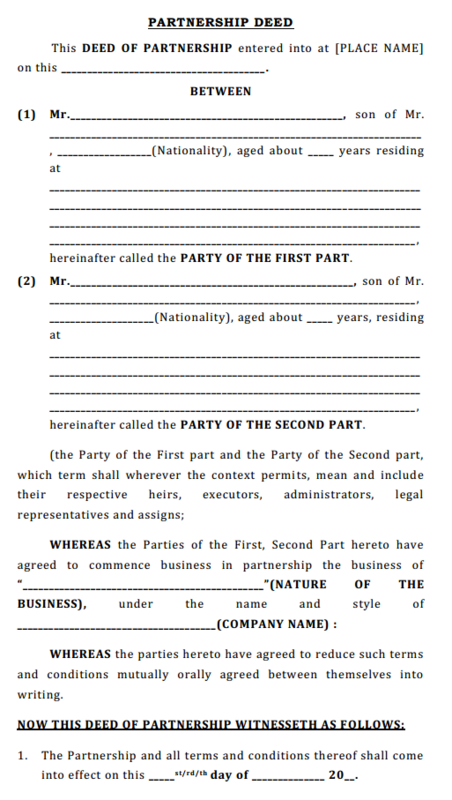 Any dispute between partners during or after the Partnership Deed has to be referred to an arbitrator under the provisions of the Indian Arbitration Act, 1940. The Partnership Deed will be considered legal only after it is witnessed by one witness each from both parties. This form is useful for laying out the details of a partnership while setting up the firm ensuring smooth functioning.